Cumbria Walks leave you absolutely spoilt for choice. From all day hikes to well known peaks, to fabulous family rambles suitable for toddlers and grandparents. Choosing where to walk can often be agonising! Do you walk an old favourite or try something new? If you are travelling to Cumbria during the peak holiday season then it is often beneficial to walk in the area of your accommodation, so that you spend your vacation on the hills rather than in a jam on the roads. If you are booking a self-catering holiday then why not look for one of the Lake District Cottages that enables you to walk right from the door? Looking for short walks in the Lake District? Over the past ten years or so our walks have been tailored to younger children. This has been a great opporutnity to take advantage of some of the stunning scenery available from the lower fells. Not all peaks are out of bounds for younger children however, and indeed there is nothing more satisfying to your child than their first peak! Looking for easy Lake District walks. These are some family favourites, we hope that you enjoy them too, please let us know if we can include your family favourite walk! If you love walking then hiking in Cumbria has to be one of the most rewarding experiences. If you would like to submit a walk or a hike, then we would love to hear from you. This walk is from The Guardian and starts in beautiful Western Cumbria. Its 20 miles / 32.1km in distance and will lead you off the tarmac and through Langdale and Mickleden passes and then the more remote and less trodden Wasdale. Just for good measure, it includes a yomp up to the top of the 978m Scafell Pike as well! Ignore the photograph, they are currently showing one of Orkney! though this may get changed, and read more about this lovely route using National Trust Campsites and day 1 conveniently has you camping close to the famous Old Dungeon Ghyll Hotel, perfect for a post walk pint! This walk featured in The Guardian's Best of British Walks. Graded as easy this 4 mile (7km ) walk will take a couple of hours - possibly longer if you take a scrummy picnic to enjoy those views. 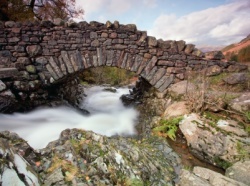 In fact talking of views this route will also have you walking past one of Cumbria's most photographed bridges Ashness Bridge. Something I always look for in a walk is whether it can be extended or cut short if youre feeling energetic/tired or if the weather conditions change. The Old Man of Coniston walk is perfect for this with multiple variations to extend or cut short or stay at low level if the weather is poor. Ive done this walk so many times Ive lost count, once starting at midnight on mid-summers day to watch the sunrise, another time I got caught in a driving blizzard (dont recommend this, very dangerous), yet another time with my 11 and 13 year-old children on a lovely summers day. There are stunning views from the top of the lakes hills and out to sea to the South and West. Its quite a steep and long climb so you should set aside a full day, its best to be walking by 0930. Without wanting to be a kill-joy, I have to say that the weather in the Lake District can be unpredictable at all times of year. Please read this Disclaimer. Where to Start: The best place to start is Coniston village on the North West shore of Coniston lake. Its a pretty village and theres parking in and around plus a couple of shops to pick up essential supplies (sandwiches, water, any clothing you forgot!) before the walk. Make your way to the Black Bull pub right in the middle of the village near the hump-back bridge. Facing North outside the Black Bull pub on the main road turn left up a minor road. This minor road would lead you up to the Coniston Copper Mines valley, though you will not go all the way up this valley. The road becomes a rough track after about ¼ mile and climbs with a wood to your left. As you emerge from this wood look out for the deep gorge to the left. At the end of the gorge there is a pretty waterfall and around here you will see a left-turn over a bridge. Take this turn and just over the bridge turn right on to the footpath. Initially the footpath climbs gradually, turning West and offering you views in to the Copper Mines valley. Ignore the left turn after about ½ to ¾ of a mile, shortly after which the path climbs steeply through some old slate quarry workings. Some of the old equipment (trucks, rails and steel ropes) are still around and I always imagine the hard life of the men who once worked there. This is a good spot for a rest and a sip of tea from your flask. Levers Water: Head off roughly North along the ridge, you will descend slightly into a saddle and then climb again to a rounded rise, then descend for a second time, this time a little further but still heading North. In the bottom of this saddle, about a mile from the top of The Old Man of Coniston there is a little path to the right (heading East) that descends very steeply to the tarn of Levers Water. On reaching the tarn, turn right and follow the path halfway round the tarn to the weir. Turn right again (heading South-East now) and descend in to the Copper Mines Valley. Once into the valley you should be able to see the bridge you crossed near the waterfall early in the walk. Retrace your steps to Coniston village. Swirl How: Follow the directions for Levers Water above but do not turn right down to Levers Water, continue North. After about another mile of gradual climbing you come to the next peak, Swirl How. (Be careful not to overshoot at this point, if descend from Swirl How going North its a long way back to Coniston!) On top of Swirl How turn right (East) and descend a steep rocky path called Prison Band to another saddle. In the saddle turn right (initially South-East and eventually South) and descend to Levers Water. Keeping Levers Water to your right, continue to the weir and follow the path beyond, descending in to the Copper Mines valley. Once into the valley you should be able to see the bridge you crossed near the waterfall early in the walk. Retrace your steps to Coniston village. Weatherlam: Follow the directions for Swirl How in the saddle after descending Prison Band, dont turn right continue straight on (actually approximately North-East at this point) and climb for just over ½ a mile to the top of the next major peak, Weatherlam. At the top of Weatherlam turn right (South) and start the descent. Shortly below the summit the path forks, it doesnt matter which fork you take, both will lead you back to the Copper Mines valley. I prefer the left fork (still heading just slightly East of due South) as you stay on the ridge and keep long views over the Southern Lakes for longer. Once into the valley you should be able to see the bridge you crossed near the waterfall early in the walk. Retrace your steps to Coniston village.